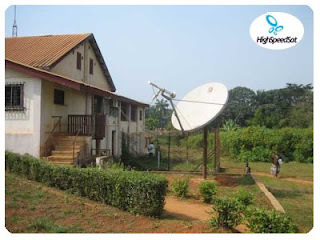 Internet firm Google and Europe's biggest bank HSBC have thrown their weight behind a plan to provide cheap, high-speed Web access via satellite to millions in Africa and other emerging markets. Google has joined forces with the bank and cable operator Liberty Global to back a group called O3b Networks, which stands for the "other 3 billion" people who do not have access. It will provide high-speed backhaul for telecoms operators and Internet providers, which can then sell services to businesses and consumers. O3b networks said in a statement the satellites would be constructed by Thales Alenia Space and should be operational by the end of 2010. The coverage would reach from Spain to South Africa, include most of South America, large parts of Asia and all South Pacific Islands. The project intends to offer fibre performance over satellite to parts of the world where it is not commercially viable or practical to deploy a fibre network. Because its satellites orbit earth at lower altitudes than those used to beam TV signals to homes, they work better for Internet access where latency -- the amount of time it takes for bits of information to travel from source to destination. In some parts of the world, the company will compete with fibre-optic cables currently under construction -- for instance, over a dozen cables have been announced connecting Africa to Europe, the Middle East and Asia. The group is also hoping that Internet access will prove as popular as mobile phone services have in recent years.